From the repetition of colors and textures… to the thoughtful furniture arrangement in each room… there are a lot of great interior design tips from studying this 1954 time capsule ranch home for sale in Houston, Texas. The home is chock-full of well thought out design, tasteful yet playful decor and traditional-with-a-bit-of-modern furniture pieces that from here on out, may never go out of style. Let’s take a look. A key reason that the decor of this home flows so well, is the mix of light, medium and dark values in each room, which creates a visual balance in the space. Each room also has a balance between natural and manmade materials, plain surfaces and patterned, and a color continuity that is created by using natural wood accented with sunny yellows, creams greens and browns — a scheme that repeat throughout the entire home and creates a unified look. 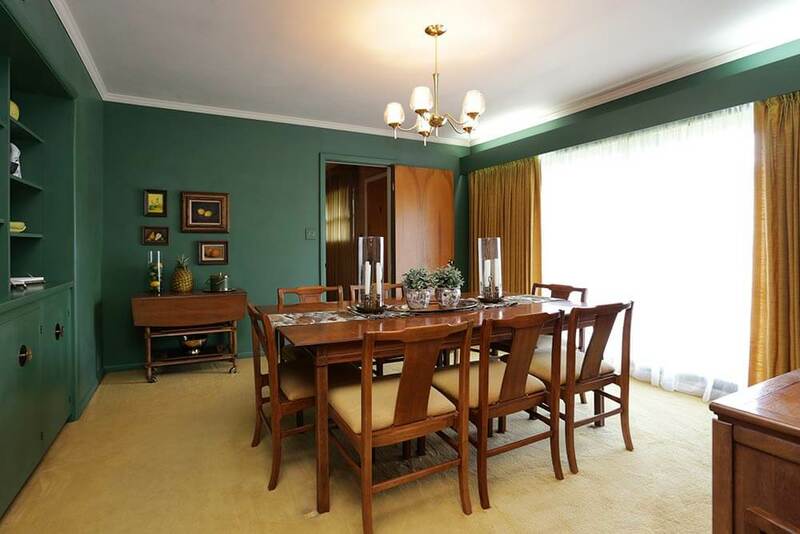 In each room, the balance between colors is adjusted — in the dining room, we see mostly rich emerald green and golden yellow with some wood accents. While in the den, where wood paneling on the walls rules, golden yellow and rich orange work together to add a sunny warmth. 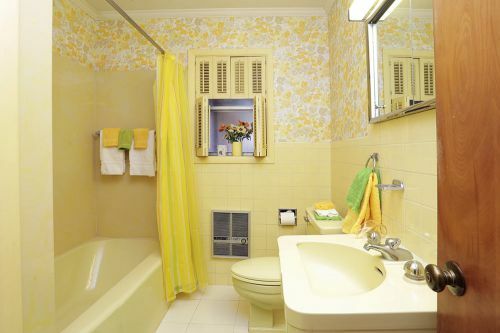 Green can be found in small doses in the draperies and accents. 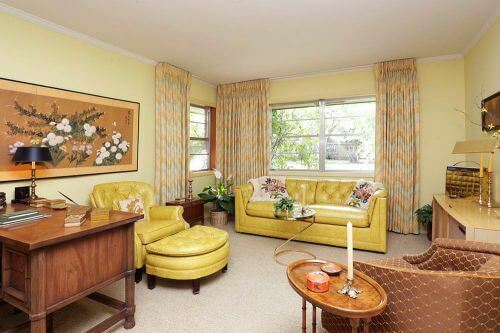 In this sitting room, golden yellow is the predominant color — with warm brown still to be found in the wood and upholstered accents. The wall art and houseplants add a dash of green to the space. Some of the rooms, such as the bathrooms, become almost monochromatic — like this pale yellow bathroom — but still small bits of the accent colors make their way into the design. What a lovely, soothing bathroom palette! 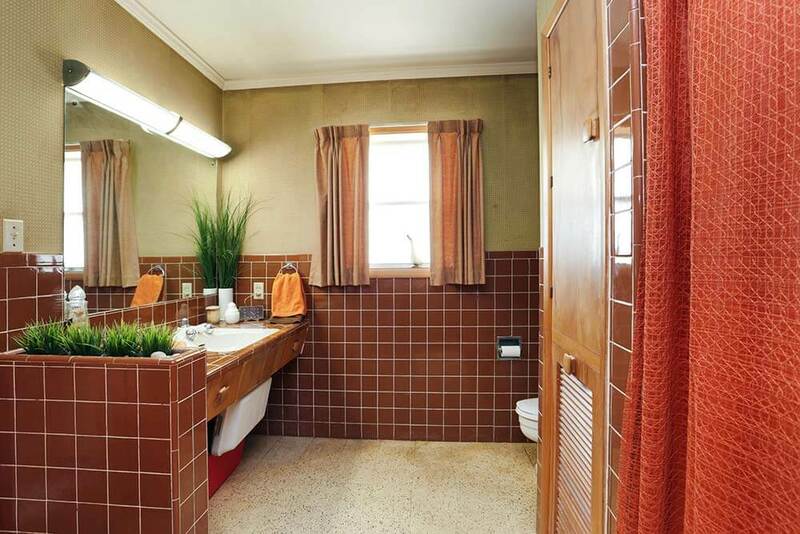 The same can be said about this mostly warm brown bathroom — another beauty! — but look — little bits of green and that vibrant orange — almost a cinnamon in this iteration — have snuck into the space. 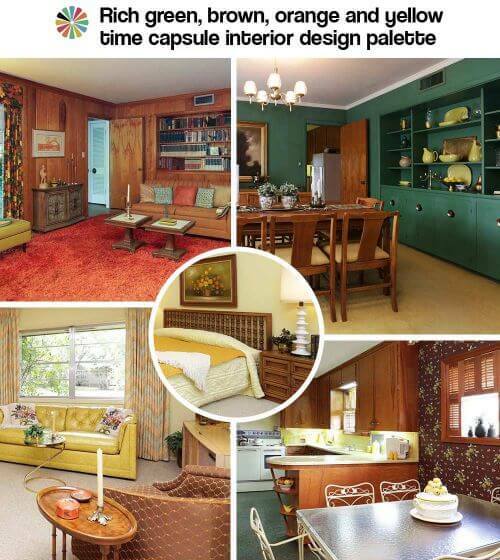 Well designed time capsule homes like this one provide so many wonderful ideas for decor and prove that good design never goes out of style — making them so much fun to study. 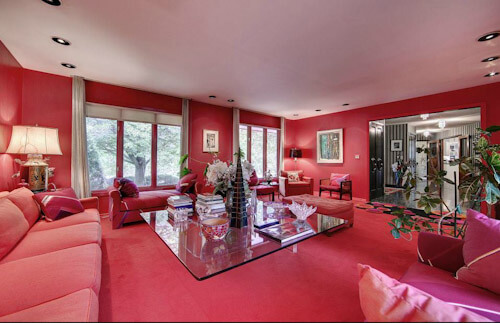 Mega thanks to retro realtor Robert Searcy for letting us feature this fabulous property. 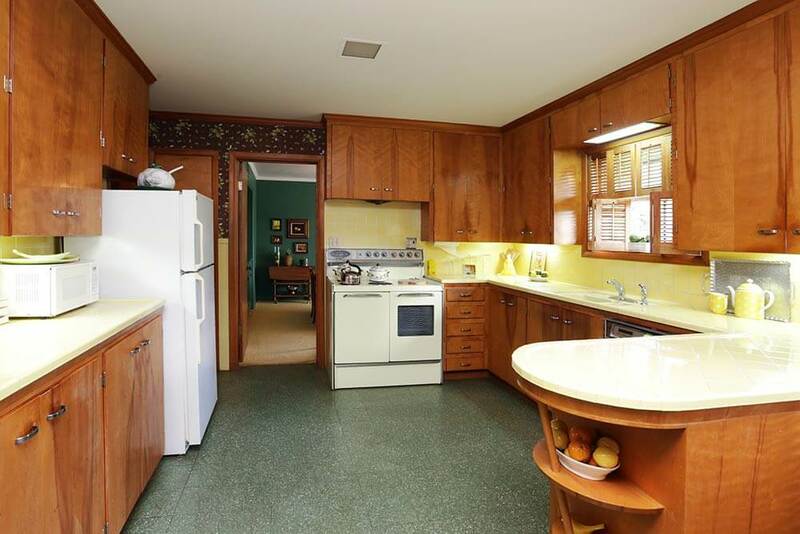 The angled-end peninsula in the kitchen is very mid-50s, several houses in our neighborhood built between 1950 and ’58 had them. Love the wood paneled kitchen, and dig the 1964 Frigidaire 40″ electric range… that oval timer clock gives it away – one year only! I love it! 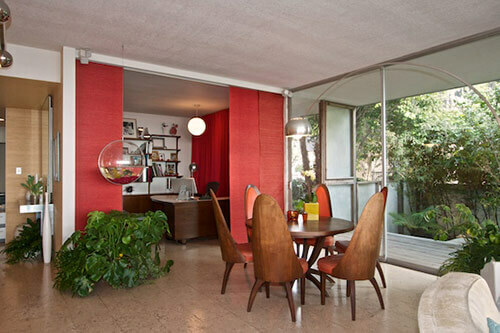 You are so right, the color combinations and flow throughout the house are very pleasing. I’d take it furnished! I love it! 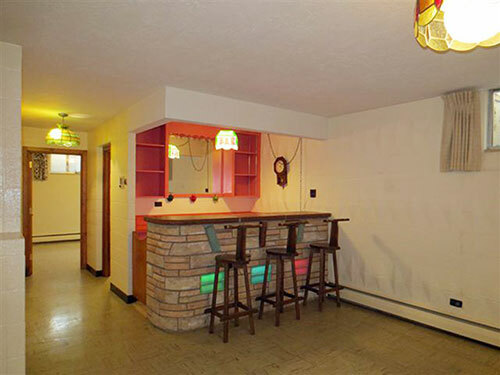 What do you suppose the kitchen floor is? 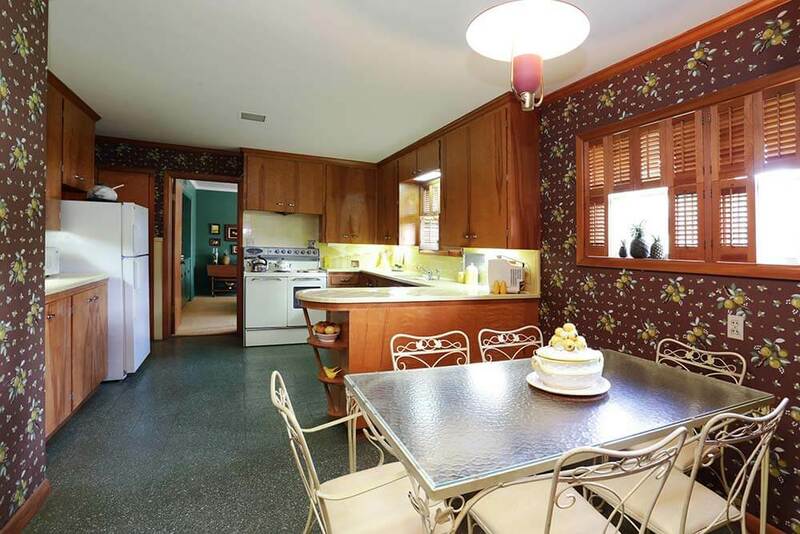 Those appear to be 9″x9″ or 12″x12″ vinyl or vinyl composite tiles…. $260,000! I would have guessed $750,000! Boy, do I ever live in the wrong part of the country! This house is AMAZING! 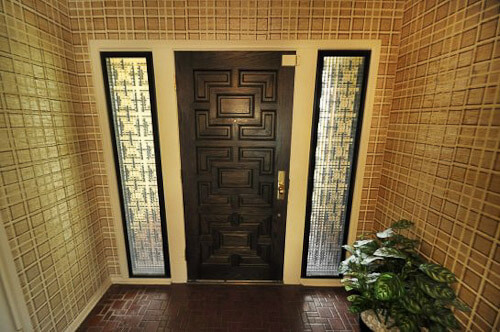 I grew up in a beautiful MCM custom built brick ranch and my parents still live there -beautiful home. Many of the same featues in this one. I have spent 22 years trying to make my “ugly duckling” as nice! I have scored several MCM furniture pieces from a local time capsule at my favorite 2nd hand store down the road. They are what the house was begging for, it all just “feels right now”. I’m so pleased i could keep most of the pieces together. To answer some questions: It’s the original 9×9 tile. The wallpaper in the kitchen and breakfast room is still the original paper put in the house in 1954. The homeowner kept extra pieces to make repairs if chairs damaged the paper or something like that. The accordion door in the master bath hides the closet area. 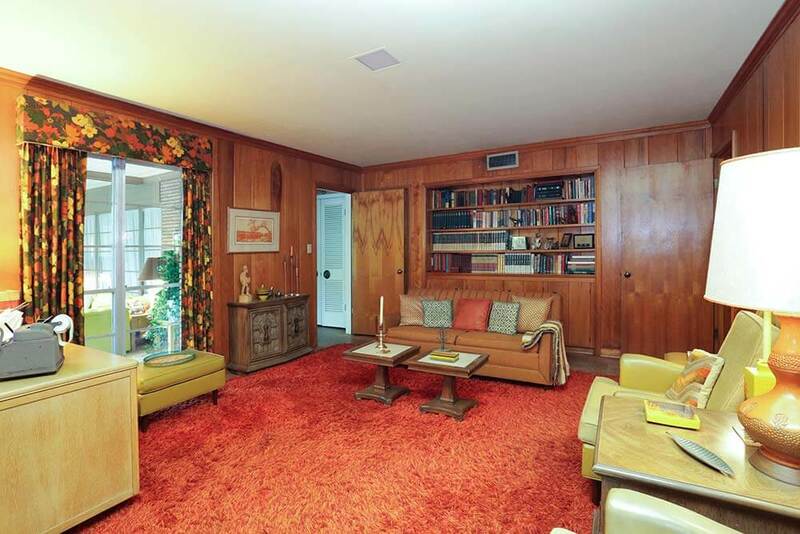 The orange shag is the den is actually an area rug, over cork flooring.